Manoj was surgically managed with Posterior instrumentation for his injury, which strengthened his back. Manoj‟s condition brought massive sorrow to the Rai family specially to his wife who was looking after her two month old child . 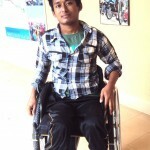 On July 2014, Manoj was brought to Spinal Centre for comprehensive rehabilitation. Manoj spent three months at Spinal Centre, receiving regular therapy and motivation from nurses, patients and volunteers. During his stay, he had very constructive outlook towards all at the Centre. Within a few months, the Therapists were successful in helping Manoj regain his balance, enabling him to walk with the help of bilateral Knee Foot Orthotics (KFO) in Walker. Ending last month, prior to his discharge, we are all pleased with the progress Manoj showed during rehabilitation at our Centre. His stay at Spinal Centre was exclusive and pleasing for all. This month, Manoj left our Centre with his supportive wife to continue his work back home.